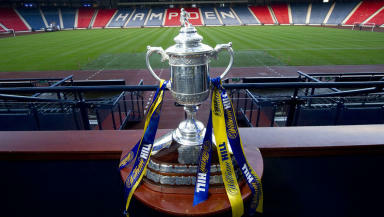 Holders Celtic set to kick off their defence of the trophy against Airdrie on Saturday. Premiership teams enter the Scottish Cup as the famous old tournament reaches the fourth round this weekend. Rangers were expected to be the first top-flight side in action at League Two side Cowdenbeath on Friday night, but the tie was called off due to a frozen pitch. Cup holders Celtic, meanwhile, take on Airdrie from League One on Saturday evening. One of the more intriguing fixtures of the round sees Championship high-flyers Ayr United face top junior side Auchinleck Talbot in a local derby. Hearts take on Livingston to bring the curtain down on the weekend's action at Tynecastle on Sunday. The draw for the fifth round will take place after the final whistle blows in Gorgie. Scores, reaction and updates will be available throughout the weekend on the STV Sport website.